The Path to Purchase is complex today with digital platforms and social networks changing the relationship between brands and consumers. The traditional model of AIDA (Awareness, Intent, Desire, Action) is not so simple any more. 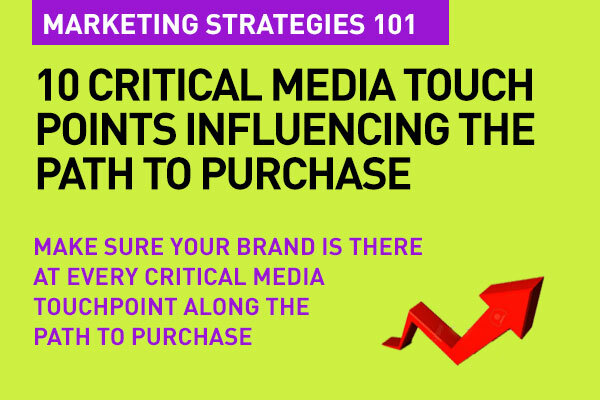 As marketers we need to be aware of the 10 specific media touch points that have important effects on the Path to Purchase. Consumers today use multiscreen media to learn more about the products they mean to buy. Their lives are empowered with technology making it easier, simpler, and more meaningful. What can brands advertisers do to connect with their audience and move them from being consumers to customers? What's not surprising at all, is most of these media touch points are actually digital. And while off line media actually creates great awareness, they push our audience towards more digital engagement – particularly Search. And let's not forget that beyond the initial awareness, the intent phase is mostly digital. Intent is the new black in digital marketing. In-the-moment marketing is what's hot. One way to start is to gather insights about your customer, your target audience, your consumer. You may find from the data that you'll get – and the insights that you convert from data that all the touch points mentioned below may not be relevant. It also might tell you, that in perspective of your brand and product or service, which ones are more critical than others. Customer Insights is your First Step in Digital Marketing. 1. Newspapers and magazines were important touch points on the path to purchase for 55% of those surveyed. This isn't necessarily just advertising, but also content in these formats. You need to be there. 2. Retailers and Store visits showed a high 69% considering it important . This is natural, and is probably the last touch point before the actual purchase. A last minute offer in store, a special feature on another product often switches the final decision. Today, people are 'showrooming' – pulling out their mobiles and comparison shopping just before making the purchase. 3. TV and movies had an effect on 51% of the people. We already know that tv advertising or in-cinema advertising creates awareness. It's important, but people then move on to Search, for example to complete their decision. But a 51% share does not make that ad on tv critical. 4. Word of mouth and Word of Mouse shows a whopping 74% of the audience saying this was an important touch point on the path to purchase. Friends and family making recommendations ranks high. As do comments and reviews shared by them – either via word of mouth or even online. We know that today, people just don't trust brand messages. They would rather hear it from people just like them. One point: Neither the offline media touch points above, or the online media touch points that are critical are in any order of engagement. They pop in and out of the decision funnel at certain stages. And by the way, the Retailer and Store visits as touch points apply online as well – meaning e-commerce purchases. 5. Company / Brand Websites and Apps are important to 59% of those surveyed. This is where your audience finds out more about the details. The product features, the in depth look at all the benefits. You website is critical here as a source of inspiration towards the path to purchase. 6. Pinterest features as an important media touch point via social showing 56% affected. Not unusual because Pinterest is far beyond just product shots, but features various uses, how people benefit from them – and that is content stories told beautifully via visuals. Ikea does this really well. 7. Facebook is in there showing that content about your brand or product influences around 56% of decisions. That's not just your product Facebook page and posts, but what people are saying about it on their posts as well. 8. Twitter had an effect as a touch point on 61% of those surveyed. Not just what your brand says on twitter, but people seek out what others are saying as well using relevant hashtags. 9. 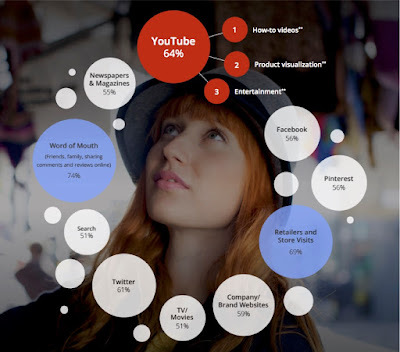 YouTube is high up there with it's presence both as a highly engaging medium but also as a repository of user generated content – reviews, unboxings, fun facts, usage etc. YouTube's "How To" videos are a massive contributor to your product being on top of mind and also towards the final decision. How to videos on You Tube are growing 74% year on year, because people trust them – they are user generated for the most part and work hard towards that Word of Mouth factor. 10. Search was mentioned as critical by 51% of those surveyed. Search actually inputs into many other touch points. I want to look up how to use your product, I use YouTube as a search engine (YouTube is the world's second largest seacrh platform, next to Google). I want to know about the details of the product, I Search for your website. Search sits across many other touch points in that sense. 67% of consumers seeking information on Search about a product were driven there by an offline channel. And 20% were driven there by an online display ad. Search provides what Google calls 'product visualization'. It is also an entertaining content format – and provides a great opportunity for your brand both from your branded content and as well, user generated content point of view. Search is always on, and it's important that you are there when people seek out solutions. Search is the great connector across the AIDA model, and it brings together all the offline and online media touch points on the path to purchase. Those are the important media touch points. And as you see, a large majority of them are on digital. Sometimes, you need help with some of the channels, specially the digital ones. While your goal should be to address all or most of these channels or touch points, again focus on the ones that are absolutely critical for you. Lear that from insight. And that's the basics. That's Digital Marketing Strategies 101. This is a generic view point, and I think it is an overall perspective. 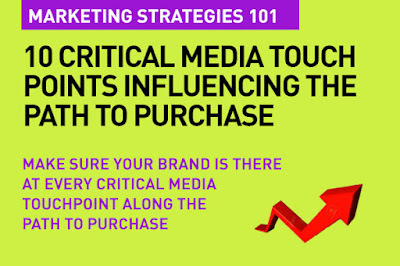 There are more media touch points (or less) depending on the product or the vertical within the industry. Some one looking to purchase a beauty product won't be influenced in the same way as someone looking to buy a camera. I guess, insight and data will lead to that for marketers.